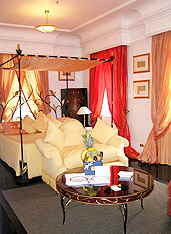 Hotel Majestic Roma is an intimate, romantic hotel with 81 stunningly appointed rooms and 19 suites. It is old-world opulence at its best with outstanding service. The Hotel Majestic Roma, www.hotelmajestic.com is an impressive hotel that was built in 1889, and was the first hotel on the Via Veneto. It is an intimate, romantic hotel with 81 stunningly appointed rooms and 19 suites. It is old-world opulence at its best with outstanding service. The Sala Verde, a grand scale room features an amazing hand-painted ceiling, red silk walls with red and lime green silk draperies, sofas and chairs, 2 Murano crystal chandeliers, and oriental carpets. There are 2 smaller, but equally impressive rooms, the Mozart Room and the Chopin Room both of which also have hand-painted ceilings. Successfully blending the old with the new, the hotel has recently added a Fitness Center to meet guests’ needs. Enter through a space-age door and you are in a round room with striking marble and wood floors, which features state-of-the art Techno-Gym equipment, 4 televisions with individual headsets, a relaxation room, fresh fruit and bottled water and is open 24 hours every day. The elevator is a charming reminder of the history of the hotel, with its intricate iron lacework. Attention to details radiates throughout the hotel, from the orchids at the front desk, to the ornate floral arrangements located throughout the hotel. 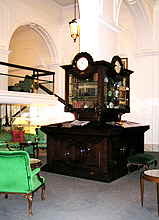 Guests can relax and read the newspaper, use the Internet, or play games in the aptly named Clock Room which features 4 clocks depicting world times. Take a stroll through the hotel and you will notice an impressive private collection of Picasso paintings in the hallways. We were pampered royally in the phenomenal Presidential Suite, which consisted of 2 very large rooms. Our bedroom had a king-bed with an ornate black and gold metal 4-post canopy, and was sumptuously dressed in yellow with orange pin dot fabric. Gleaming black wood floors showcased 2 custom tall chests of drawers on either side of the bed, which upon closer inspection, one of them turned out to be a mini-bar, 2 night stands where placed on either side of the bed, and there was an ornate yellow sofa at the end of the bed. There was also an armless chair and a large round coffee table that beckoned to us with a large silver fruit bowl and a box of Hotel Majestic Roma cookies. Against the wall, there was another ornate cabinet, and there was a mirrored walk-in closet, which had built-in drawers and a safe. 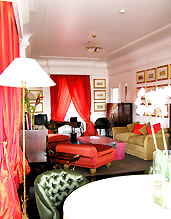 This corner room had 4 windows lavishly decorated with orange stripe silk as well as a deeper reddish orange silk fabric. All rooms have high-speed Internet access via a cable, and there are new almost soundproof windows. The large white marble bathroom held a large assortment of Hotel Majestic Roma branded amenities, a Jacuzzi tub, walk-in shower, Pedersoli towels, linens, robes and slippers, a stool and even a scale for the fitness conscious. Our large bedroom connected to the large living room via a small foyer. The living room was a spectacular room with intricately carved crown moldings, and there was a sofa that ran the length of 1 of the walls, with a series of paintings in gold frames over the sofa. Two ornate custom cabinets flanked the sofa, one of which was a mini-bar. There was an exceptionally large coffee table flanked by 2 armless chairs, as well as a large Philips television. There was also a desk that any executive would love with leather desk appointments. Behind the desk, looking out the window you had direct views of the Swiss Church. There was also a green silk chair in the corner. There was also another ornate cabinet that held a bouquet of curly bamboo, anthurium and birds-of-paradise. The 4 floor-to-ceiling windows were swathed in varying shades of orange silk. The large round dining table with white orchids placed in the center of the table, and 4 bottle-green silk covered chairs was the perfect spot to sit and enjoy a piece of fruit, as it had wonderful views out onto the terrace. However, the real pièce-de-resistance was the large Roman terrace, which you entered through an enormous window that ran the width of the room, which rotated to open. From the large terrace we had impressive views of Rome including St. Peter’s Church and the Quirinale. 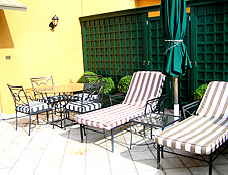 There were 2 chaises on the terrace, which we sat in each morning to soak up the warm Roman sun. There was also another smaller white marble bathroom with a combination Jacuzzi tub/shower, hairdryer, make-up mirror, toilet and bidet, and more of the branded Hotel Majestic Roma amenities, as well as another mirrored walk-in closet with built-in drawers and another safe. Breakfast was an elegant affair served in the La Veranda restaurant consisting of a lavish buffet of assorted fruits, meats, cheeses presented under glass domes, smoked salmon, scrambled eggs, pork sausages, chicken sausages, cherry tomatoes and cooked mushrooms, cereals, juices, yogurts, and baskets of tantalizing hot fresh pastries brought to the table by waiters in white dinner jackets, with black trousers and black bow ties. The service is attentive with staff quick to bring another glass of juice or a cappuccino. We had a romantic dinner at La Veranda, and also a very pleasurable lunch at their other restaurant, La Ninfa, which we write about in the Restaurants section. Read our other articles on Rome in Destinations, Hotels & Resorts, Restaurants, Chefs’ Recipes and Music Scene. © February 2005. Luxury Experience www.luxuryexperience.com. All rights reserved.